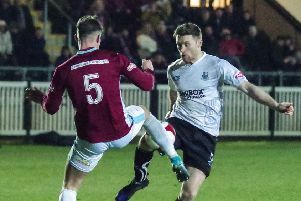 Bamber Bridge produced arguably their best performance of the season to earn a point at NPL Premier Division title favourites South Shields. The home side had not dropped a point from 13 games in front of their own fans this season, but that perfect record was ruined on Saturday as Brig came from behind to draw 3-3 in front of 1,582 supporters. However, the visitors got off to the worst possible start when Nathan Lowe found the bottom corner from the edge of the area with a fine shot. Despite the setback Brig responded but they were almost caught on the breakwith Lloyd Rigby in the Brig goal making smart stops. Danny Forbes struck a volley over the bar following a fine passing move down the left wing, but disaster struck in the 45th minute. A corner from the left, was headed on to the cross bar by Shields’ Neil Briggs and fell to Jon Shaw to volley home. Brig began the second half well and an Ally Waddecar flick header was well saved but he was then upended inside the area and referee pointed to the spot. Waddecar stepped up and stroked the ball home to reduced the deficit. Thoughts of taking a point looked to have been quashed a few minutes later when South Shields were awarded a penalty themselves after a foul by Matt Lawlor. Briggs made no mistake. Far from letting their heads drop, Brig roared back. Regan Linney came on to replace the hard working Danny Forbes and his movement immediately began to cause the home defence problems. On 80 minutes, Linneyfound space on the right hand side of the area, and chipped forward a delightful dinked pass to Matt Dudley, who squared for the inrushing Chris Marlow to slam home from eight yards. Just three minutes later, Brig had their point when Lawlor rose to meet a corner from the right. His superb downward header from 10 yards bounced down, over the keeper’s outstretched. Elsewhere, Lancaster drew 1-1 at Whitby Town. In the West Division, Kendal Town were 4-2 winners over Market Drayton. 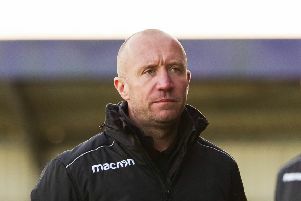 In the National League, AFC Fylde were held 1-1 at Maidstone United.